For the city in Chile, see Punta Arenas. Images, from top down, left to right: the Port Laborer Monument, Tourists Pass Avenue, The Cathedral within Central Park, Crown Princess docked at Puntarenas' Port, docked fishing boats, Puntarenas Pier. Puntarenas (Spanish pronunciation: [puntaˈɾenas]; is the capital and largest city in the Province of Puntarenas, on the Pacific coast of Costa Rica. The Puntarenas name comes from the portmanteau of Punta and Arenas, which means Point and Sands, respectively. Therefore, in English the name would mean "Sand Point". The name is first referenced by the arrival in February 1720 of the pirate Chipperton to the area, which recorded in his journals to have arrived to a "Punta de Arena", referring to the needle-like area on which the city stands today. 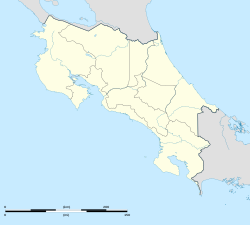 The name is also given to the oddly shaped province of Puntarenas, which as the most extensive province in the country, has its largest section in the South, far from Puntarenas city. There are some 100.000 inhabitants in the town and surrounding neighborhoods. Its Pacific Ocean beaches attract many tourists, especially surfers. It is also a possible stopover point for the tourist destination Monteverde, to the northwest. Its port, Caldera, is one of the main ports and the oldest port in the country. There are regular scheduled ferries to and from Puntarenas and the Nicoya Peninsula. Puntarenas was discovered by Gil González Dávila in 1522. Despite the use of the Gulf of Nicoya as an entryway to Costa Rica's inland territory, the port of Puntarenas was not developed until 1840 when coffee production in the highlands reached exportable volumes. In 1845 the Congress of the Republic declared Puntarenas a duty-free port (with the exception of Cognac and hard liquor). Originally, the coffee was brought to port in oxcarts via a trail through the mountains. In 1859, a stretch of railway track was completed between Puntarenas and the town of Esparza (one of the country's earliest Spanish settlements, founded in 1574). Eventually, the railway was built all the way through to San José and service was inaugurated in 1910. With the railway connection to the Central Valley, the Pacific port's activities continued to be a major part of the region's economy throughout the 20th century. However, due to the aging and deterioration of the port facilities and the need to accommodate the much larger vessels of modern shipping fleets, a new port was constructed in the 1980s to the south of Puntarenas. The site chosen was Caldera (located at 9°54′39″N 84°43′10″W﻿ / ﻿9.9108438°N 84.7194761°W﻿ / 9.9108438; -84.7194761), where ships had anchored during colonial times. Caldera was more appropriate site for larger ships, and actually was the first port site used since 1522. The city's major football teams are Second Division sides Puntarenas F.C., who have played many season at the highest level, and Jacó Rays. Puntarenas is generally hotter than the Costa Rican Central Valley, with daytime highs ranging from 30 to 35 °C (86 to 95 °F) in the coldest/hottest months, respectively. ^ "Climate Information for Puntarenas". World Meteorological Organization. Retrieved 4 August 2012. ^ "Climatological Information for Puntarenas, Costa Rica". Hong Kong Observatory. Retrieved 4 August 2012. Wikimedia Commons has media related to Puntarenas. Wikisource has the text of the 1911 Encyclopædia Britannica article Puntarenas. This page was last edited on 14 April 2019, at 01:03 (UTC).